The paint on MUHC walls may be white, yellow, blue or mauve… but really, it’s all ‘green’. The MCH and the entire MUHC have switched to environmentally friendly paint. These are paints with no volatile organize compounds or VOCs. Growing concerns about VOCs are mainly related to greenhouse gas emissions. As paint dries after application, solvents are released into the atmosphere. Since VOCs are precursors for smog (gas mixture formed in the lower atmosphere when UV rays interact with certain pollutants), they have been identified as pollutants. 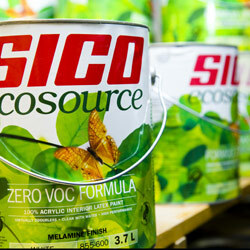 The no-VOC paint comes in a rainbow of colours, is odourless, easy to apply, durable and costs virtually the same amount. “There are no drawbacks to using this product, only benefits,” says Mr. Bensmihen. By selecting VOC-free paint, the MUHC is making a more responsible choice and helping to improve the quality of the air we breathe.